A beautifully illustrated, action-packed middle grade adventure in the spirit of Edward Gorey and Tim Burton. With fantastic Victorian-esque design, fast-paced action, and plenty of puzzles to solve, this middle grade mystery is a fun and engaging read for even the most reluctant readers. Warren the 13th is the lone bellhop, valet, groundskeeper, and errand boy of his family’s ancient hotel. The strange, shadowy mansion is full of crooked corridors and mysterious riddles—and it just might be home to a magical treasure known as the All-Seeing Eye. But if Warren is going to find the hidden treasure, he’ll need to solve several other mysteries first: What is the strange creature lurking in the hotel boiler room? Who is the ghostly girl creeping around the garden’s hedge maze? And why is the hotel’s only guest covered in bandages? 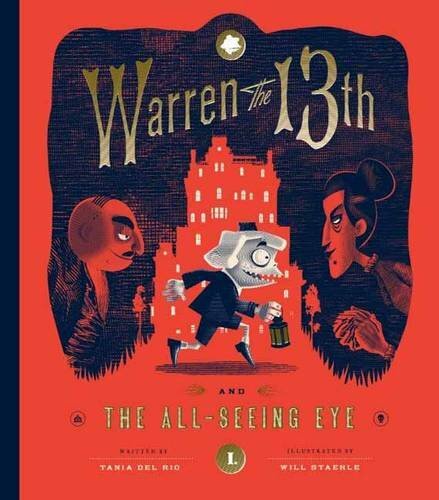 Full of puzzles, secret codes, outrageous inventions, and hundreds of intricate illustrations, Warren the 13th and The All-Seeing Eye will delight and confound readers of all ages.